This open plan loft kitchen in Charlotte, NC features four of our more unique unfitted workstations. The open plan Loft living concept that is so appealing for so many urban dwellers is also the perfect venue for YesterTec’s three dimensional workstations that hide the appliances from always being on display. 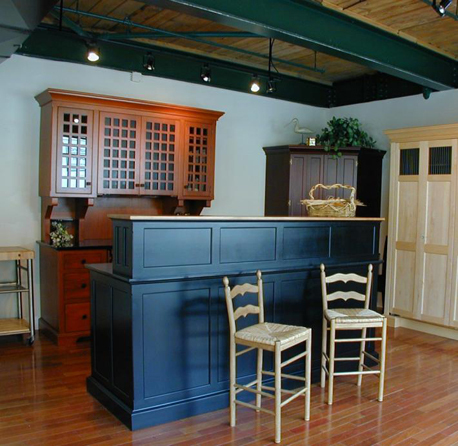 Here the kitchens ovens, dishwasher and even a complete laundry center are concealed inside beautiful workstations. In multi-task rooms of any size, substituting beautiful pieces of furniture in place of endless lengths of cabinetry, counter tops and exposed appliances is a great option that must be considered. Notice how the different finishes and door styles still make a cohesive ensemble, which is due mainly to the exposed floor, wall and ceiling surfaces that meander between each separate piece. Just like the other furniture in this Loft, the room’s surface act as the glue that hold together the entire eclectic design theme, whatever it may be. The Midnight Black sink island (S76A) is the heart of this kitchen. And the storage pie above it (ST76A) hides the messy counter top from view from the rest of the loft. The tall Range in Hampton Mahogany (TP72-MH-Tall / B72-OC) is the focal point and uses our grid doors to complete the contemporary look of this striking ensemble. The black metal panels concealing the microwave complement the black granite counter tops and the black sink base. The Natural Maple freestanding Armoire (Custom AR64-Laundry) to the right actually conceals an ASKO stacking washer/dryer, a pull-out ironing board and extra countertop and storage areas. There are just a few appliance combinations that work in these units, but having the laundry so accessible yet concealed in this busiest location in the loft is quite appealing. 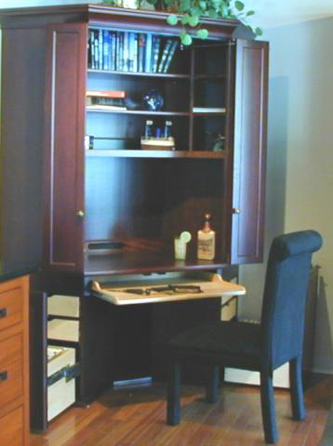 The large unfitted corner desk armoire (yes, a giant desk in the kitchen) in Bombay Mahogany (C34D) integrates a full working office complete with file drawers, computers and abundant storage and desk top space right into the kitchen area. 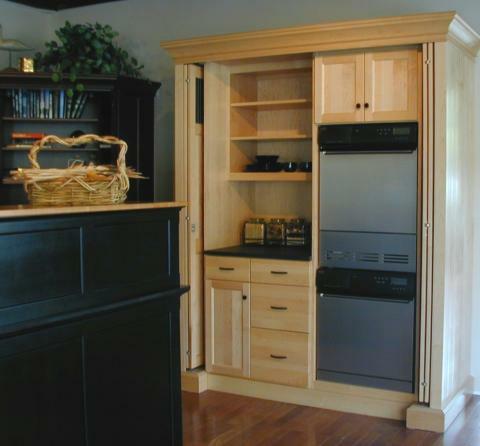 Its abundant storage opportunities can function as pantry space for the kitchen as well.